I loved the Royal Wedding. Princess Diana was a member of my health club and I once gave The Queen a guided tour of Merrill Lynch’s London office. So you can imagine how disappointed I was to not receive an invite. Especially since Becks and Posh were there. They must have thought I moved back to the USA. So I watched it on TV. Nevertheless, I loaded up on souvenir mugs, tea towels and embossed plates. Now the ultimate souvenir is available. 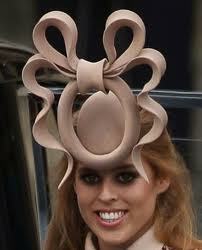 Princess Beatrice is offering her hat for sale on eBay UK to benefit UNICEF and Children in Crisis. I am so excited. It will look great above the fireplace in my study. Postscript: The hat sold for £81,100 ($131,000)! This entry was posted in Charity, Humor, Ruminations and tagged Charity, Humor. Bookmark the permalink. It did remind me when you showed the Queen round at Merrill Lynch too…. And it reminded me of the amount of sorting, binning, clearing, cleaning and dusting we had to do for weeks beforehand. The plants that appeared near our desks overnight and disappeared just as quickly the following day. They weren’t as grand as the trees in the cathedral. You definitely should have received an invite! Loved the Royal Wedding, too – went to the BBC’s live, uninterrupted big screen party in NYC. It was worth getting to the Paley Center at 5:30 in the morning all dressed in my finest afternoon wedding ensemble, plus the replica sapphire ring won in a raffle. Tea, scones, finger sandwiches, champagne, and OJ, were served, along with Penderyn single malt whisky from Wales. Who knew, scotch from Wales ! isnt there some picture floating around that everyone says is the best royal wedding photo?